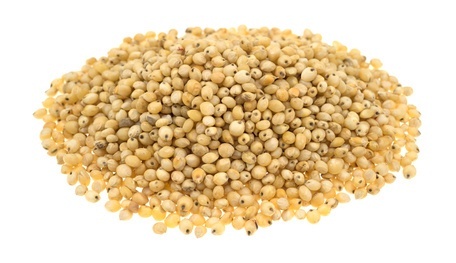 A gluten-free grain native to Africa, sorghum is among the top 5 grains produced worldwide as a food crop. Some cultures use it as cous-cous, others use it for tortillas and pancakes, still others use it like rice or as a porridge. Sorghum has a nutty flavour and a slightly chewy, tender texture. To cook, use 3 cups liquid to every cup of sorghum. Soaking overnight reduces cooking time. Bring to the boil, cover, and simmer until liquid is absorbed and grains have plumped up - if using unsoaked grains, this will take about 50 min.